Every year, nearly 1.3 million people die from road traffic injuries. According to the World Bank’s Global Road Safety Facility, road traffic incidents are the leading cause of death among youths, and the second leading cause among young adults. The United Nations Institute for Training and Research (UNITAR) has also identified road traffic incidents as the ninth leading cause of death across all ages around the world. These figures reflect a global need to improve road safety, an imperative reflected in the 2030 Agenda for Sustainable Development, which includes among its targets the reduction of road traffic deaths and injuries by 50 percent by the year 2020 (SDG 3.6). In line with this, UNITAR has launched a Road Safety Initiative with the theme of Strengthening Road Safety for Sustainable Cities, focusing particularly on low-income countries, least developed countries and small island developing states with high road traffic death rates. To enhance the capacity of government agencies and municipal authorities to develop and implement road safety strategies and plans in line with SDG 3.6. For 2017, UNITAR has lined up a series of activities on road safety, which will be conducted across the globe, starting in February. Workshops will be held in Lagos, Nigeria; Durban, South Africa; Jeju, South Korea; Bengalaru, India; and Curitiba, Brazil. 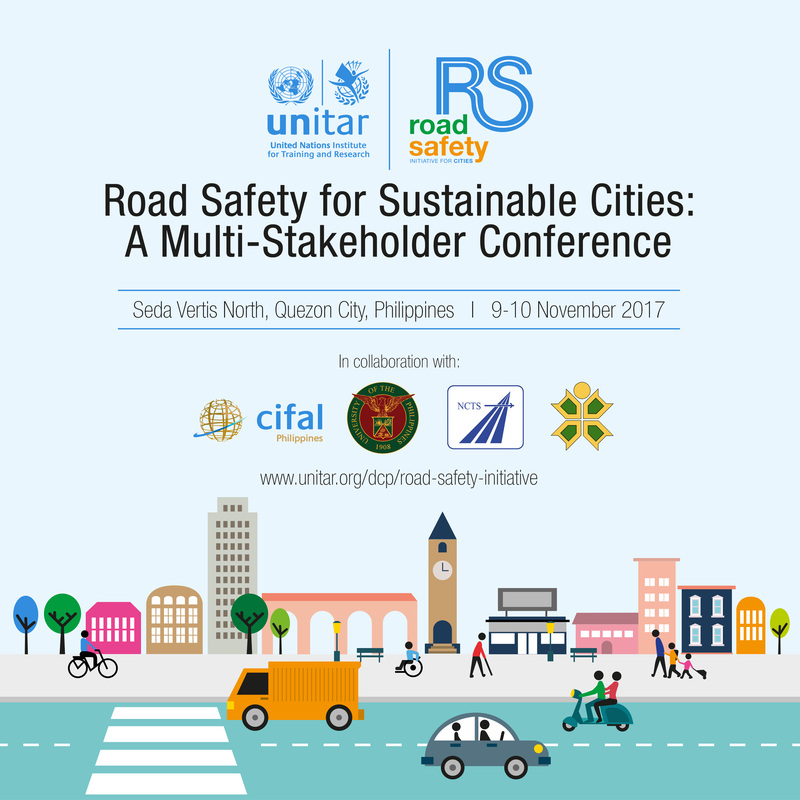 The UNITAR road show on road safety will culminate in an international conference titled Road Safety for Sustainable Cities: A Multi-stakeholder Conference at Seda Vertis North, Quezon City, Philippines, which will be held on 9-10 November 2017. The conference will bring together 150 participants from UNITAR’s international partners, national government agencies and local government units, the private sector, industry associations, media, academe, and youth, among others, in order to discuss the issues, challenges and opportunities in strengthening road safety in the Philippines and the Asia-Pacific region. The conference focuses on three key themes: road safety legislation and regulation, road and transport infrastructure, and citizen responsibility and leadership in road safety. However, aside from spurring discussion of the experiences of Asia-Pacific nations with these themes, the conference also aims to increase engagement among road safety stakeholders, especially with innovative technological industries and research institutions. The ultimate goal of the conference is to produce a document which outlines the risk factors, interventions and best practices in road safety in the region. The multi-stakeholder conference is co-organized by UNITAR, CIFAL Philippines, the University of the Philippines, the UP National Center for Transportation Studies (NCTS), and the UP School of Urban and Regional Planning (SURP), with the support of Diageo. This event is free of charge. To register online, click here.